coatings gave promising results regarding induced chloride ion corrosion. rapidly become a serious problem throughout the world. coatings are also sufficient in rebar’s protection . of the objective of the present study. prepared with cement, sand and water in ratio 1:3:0.5.
cleaned according to the ISO/DIS 8407.3 Standard . minate traces of the corrosion inhibitor and chloride ions. 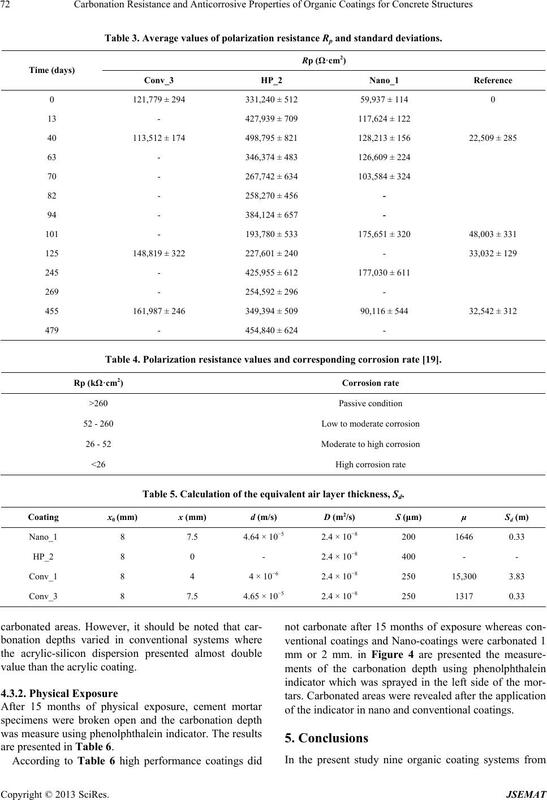 tion of this study was 15 months. Table 1. 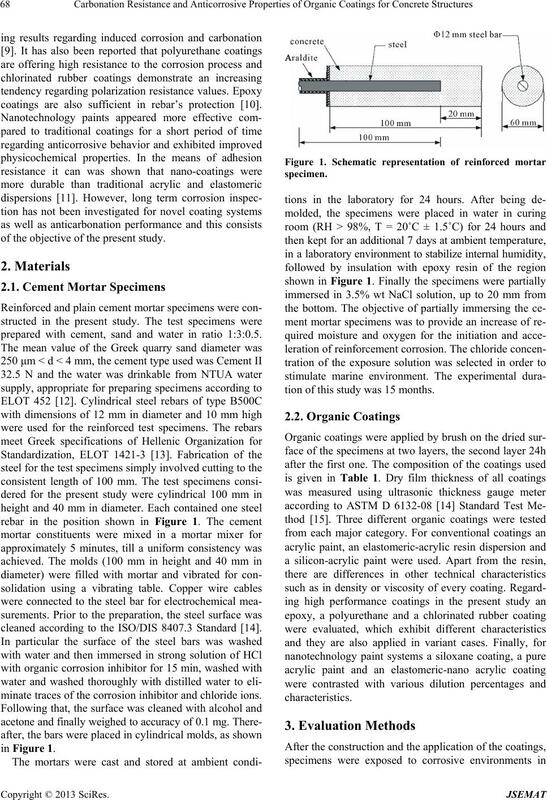 Chemical composition of organic coatings. dispersion, solids b.w. : 61% ± 2.5%. b.w. : 26% ± 2%) dilution 100% white spirit. 62% ± 1%. No dilution. with aliphatic isocyanate. Solids b.v.: 54%. solids b.v.: 50%. Diluted 10% with water. Primer with siloxanes in organic solvent. in order to determine carbonation depth. and the presence of highly resistive layer . respectively and Rp is the polarization resistance (Ohm). values are due to differences in the surfaces treatment. carbonation depth (cm) and t is the time (s). where S is the thickness of the coating (m). ing the same procedure as before. immersion in 3.5 wt% NaCl solution. Table 2. Corrosion potential and corrosion condition. 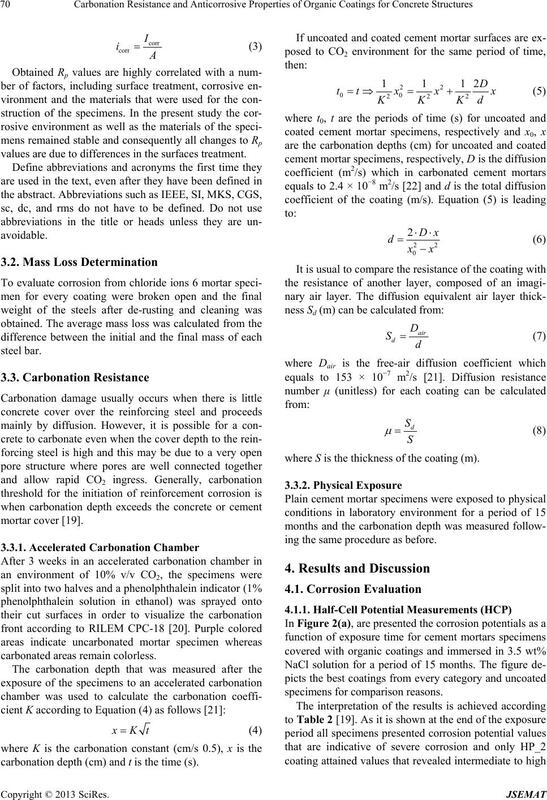 the thermodynamics of the corrosion. the coatings that performed best from each category. were used in order to obtain the following results. sented lower values than all conventional coatings. Table 3. Average values of polarization resistance Rp and standard deviations. Table 4. 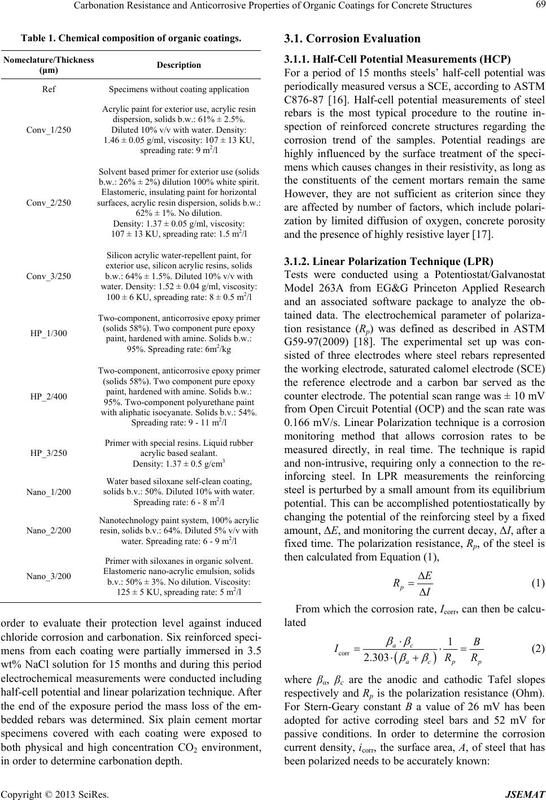 Polarization resistance values and corresponding corrosion rate . Table 5. Calculation of the equivalent air layer thickness, Sd. value than the acrylic coating. are presented in Table 6.
of the indicator in nano and conventional coatings. phenolphthalein indicator in the left side of the mortar. the organic solvents that contain. Building Research Station, Watford, 1982, pp. 1-8. Arnold Publishers Ltd., London, 1956. 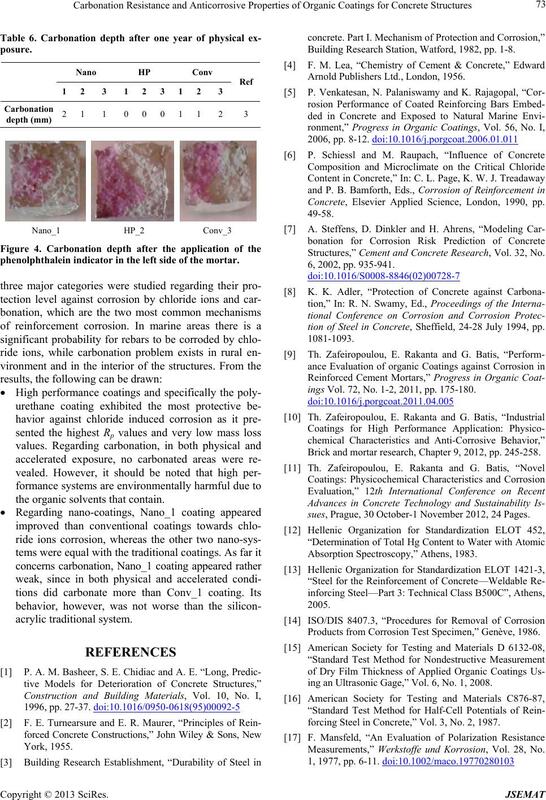 Concrete, Elsevier Applied Science, London, 1990, pp. 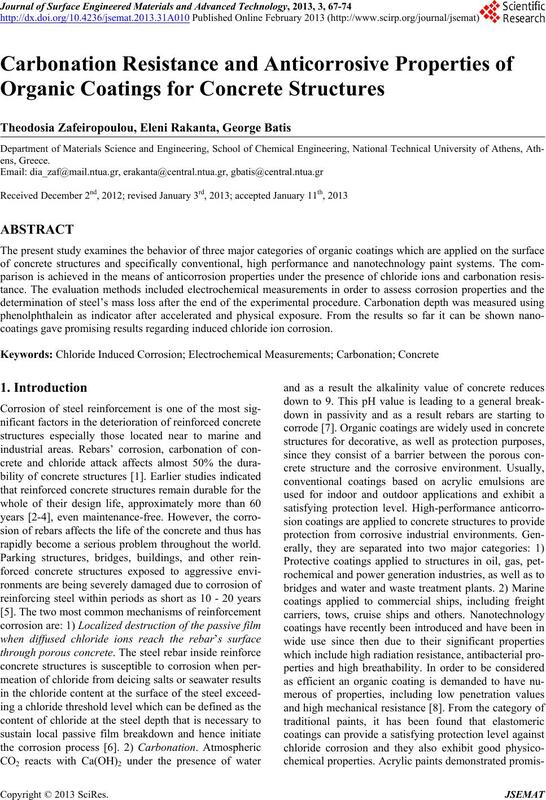 Structures,” Cement and Concrete Research, Vol. 32, No. tion of Steel in Concrete, Sheffield, 24-28 July 1994, pp. ings Vol. 72, No. 1-2, 2011, pp. 175-180. 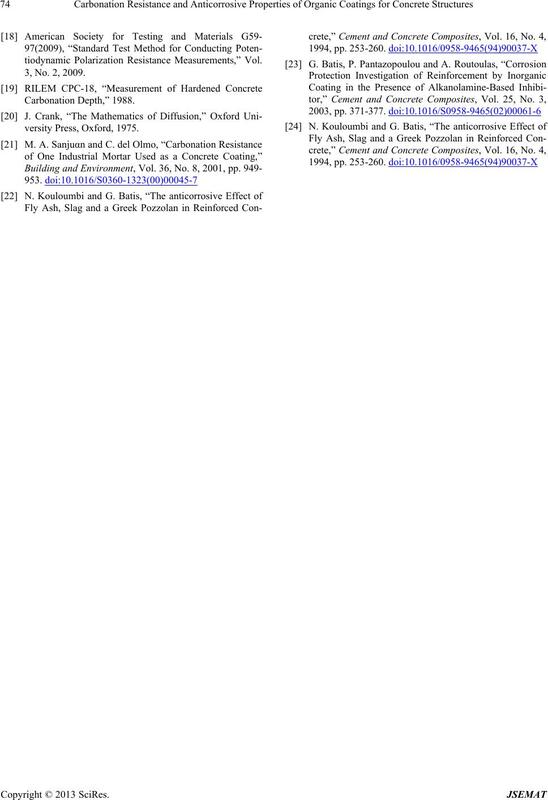 Brick and mortar research, Chapter 9, 2012, pp. 245-258.
sues, Prague, 30 October-1 November 2012, 24 Pages. Products from Corrosion Test Specimen,” Genève, 1986.
ing an Ultrasonic Gage,” Vol. 6, No. 1, 2008.
forcing Steel in Concrete,” Vol. 3, No. 2, 1987. Measurements,” Werkstoffe und Korrosion, Vol. 28, No. 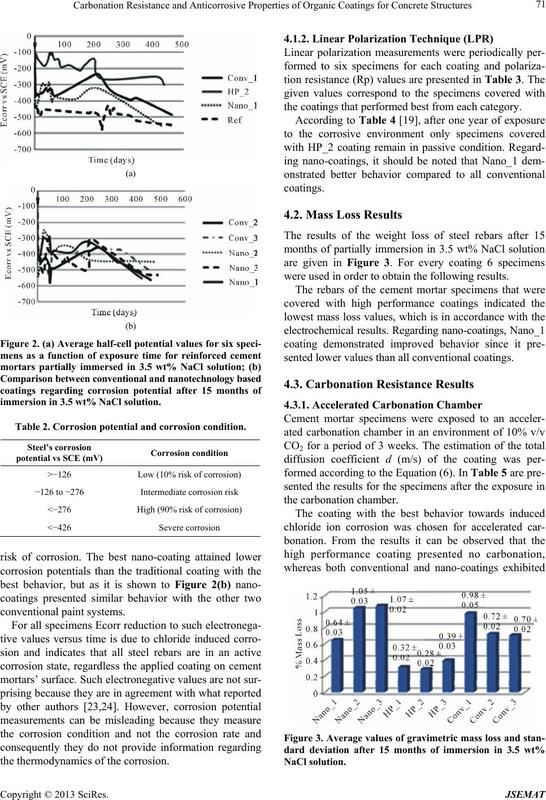 tiodynamic Polarization Resistance Measurements,” Vol.